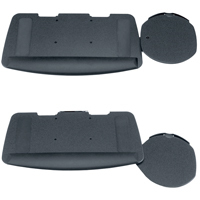 This tray is composed of 0.375" ABS plastic topped with 0.375" foam, which helps keep keyboards in place. The guard at the back prevents damage to keyboards when the tray is retracted and prevents the mouse from sliding off when using negative tilt. The slot cutouts for cables provide cord management. The standard hole pattern fits most articulating arms. This unit attaches to any standard keyboard arm. The keyboard area is 21.75" x 11.5" (55.2 cm x 29.2 cm), and provides ample room for ergonomic keyboards or conventional keyboards and gel supports. The usable mousing / writing surface is 8.5" x 8.5" (21.6 cm x 21.6 cm). 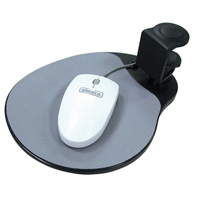 The retractable mouse platform is mounted under the tray and pulls out from either side. This unit attaches to the underside of a desktop surface or keyboard tray, and can easily be stored when not in use. The keyboard area is foam covered and 21.75" x 10.5" (55.2 cm x 26.7 cm), and provides ample room for ergonomic keyboards or conventional keyboards and gel supports. 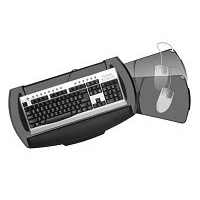 The mouse platform is top-mounted and swivels over the 10-key pad. It is a right-hand mount (left hand mount available by special order). The useable mouse area is 9.5" x 8" (24.1 cm x 20.3 cm). A 1" (2.5 cm) keyguard helps protect your keyboard and assist in cable management. The unit is composed of a metal mounting bracket with a vinyl-coated MDF board. The Phenolic Keyboard Tray with Swing-Out Mouse Tray from KV Waterloo enables users to create a wide variety of custom configurations for their input devices. The Keyboard Tray portion is 20.5" wide at the front and tapers slightly narrower (20") at the back. A depth of approximately 10" means the tray is large enough to accommodate even the largest keyboards with integrated palmrests. Two anti-skid grip strips are positioned to keep a full-size keyboard secure on the tray surface. The tray ships with a detachable Foam-Gel palm rest which reduces the maximum keyboard depth to 7", still enough space for most standard keyboards. 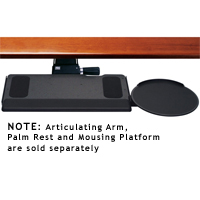 The detachable mouse tray provides an 8.5" diameter mousing surface and features a unique tilting and rotating pivot mount which can be used to position the mouse tray either level with the keyboard tray or at 0.5", 1.25", 1.5" or 2" above the keyboard tray. 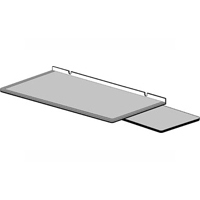 The inclination or tilt of the mouse tray can also be adjusted, independent of the keyboard tray orientation, to any angle from all height settings. A repositionable mouse guard with cord clip ensures that the mouse stays in place. The pivot permits users to swing the mouse tray into the position which best meets their ergonomic needs. The range is a full 360° at the highest settings and reduces to 90° as the elevation is lowered to level with the keyboard tray. 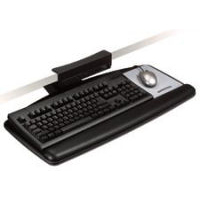 The mouse tray attaches to the keyboard tray via a clamp mount which can be secured at any point around the edge of the tray, further expanding the customization options as it can be easily reconfigured between left and right positions. Note: The dimensions of the clamp may limit the use of very wide keyboards (such a the Microsoft Natural Ergo Keyboard 4000). As well, with the palm rest installed, the mouse tray mounting clamp must be positioned about 2" further from the user as the palm rest extends the full width of the keyboard tray. 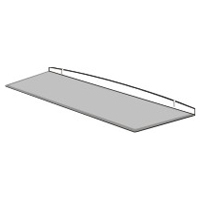 The Harmony Tray from KV Waterloo incorporates a mousing surface which can be pivoted through an arc toward the user on either the left or right side. The mousing surface easily slides to the right or left as required or can even be fully stored beneath the keyboard. Both left and right positions offer eight forward-angled settings which permit the user to move the mousing surface through an arc towards themselves, positioning it for the most ergonomic benefit. The ease with which the mousing surface can be re-positioned makes this tray a good selection for someone who has limited width for tray storage (with the mousing surface centered for storage the tray is only 23" wide) but who wishes to spread their mouse use between both left and right hands. The roughly 8" by 9" mousing surface will accommodate most mice but may not be suitable for use with some of the more specialized ergonomic mousing solutions with larger footprints as it has a 1/8" ridge along the side and back edges which limits the possible range of mouse movement. 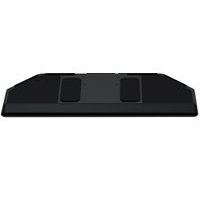 The Harmony Tray has raised rubber anti-skid pads to prevent the keyboard from moving and is only compatible with keyboards at least 15” in width. The Harmony Tray is thicker than some other trays due to the inclusion of the sliding mousing surface. As a result it does elevate the keyboard higher off the keyboard arm. Users who wish to keep the keyboard and mouse as low as possible without interfering with the movement of the legs may wish to consider other options which present a lower profile. At 27" wide, by 10.625" deep, the Big Keyboard Tray from Humanscale provides ample space for safely deploying a full-size keyboard and mouse on a single, level surface. 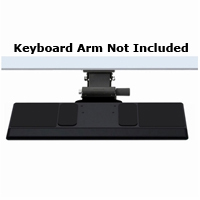 When mounted to a height adjustable keyboard arm the Big Keyboard Tray becomes a versatile height- and angle-adjustable workstation accessory that can accommodate users of all heights. The Big Keyboard Tray is composed of .25" thick rigid phenolic resin and is equipped with two foam rubber keyboard gripper strips to position the keyboard securely. Integrated 7" wide by 8.25" deep hard-surfaced mousing zones on the right and left sides of the tray enhance its versatility. Raised ridges with cable retention capabilties edge the sides and back of these surfaces to prevent the mouse from falling off. 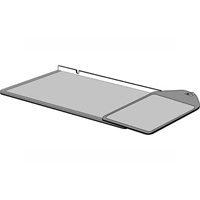 The front edge of the tray can accommodate either of the optional palm rest accessories.